Montréal has been welcoming visitors since 1513, when Jacques Cartier first landed on the island to be greeted by a thriving Iroquois settlement called Hochelaga, located near the present site of McGill University’s Lower Campus on the southern slope of Mount Royal. Our city offers rich history and culture, striking scenery, quaint neighborhoods, lively entertainment, great food and drink (from haute cuisine to fusion to ethnic, with an emphasis on neighbourhood bistros), eclectic shopping, and seasonal sports, all savoured by a lively, hospitable, and cosmopolitan population. Canada’s second-largest city may be the second-largest French-speaking metropolis on the planet (after Paris), but the attention lavished on its Frenchness—Bistros! Baguettes! People saying “Bonjour”!—tends to nudge aside the many other ethnic communities within Montreal’s remarkably diverse urban sprawl. Italians, Portuguese and Lebanese have a very visible presence, and the city hosts annual festivals dedicated to everything from Asian-American films to Caribbean food. Throw in a pulsing alternative community and creative scene (this is a place that engendered talents as diverse as Saul Bellow, Arcade Fire and the irrepressible William Shatner), and a whole new Montreal opens up. Whether your passion is Syrian cuisine, contemporary art or vintage shopping, Montreal is serving it up with aplomb. C’est vrai. Montréal’s official history began in 1642 with the first French Catholic settlement of Ville-Marie, but its human history is much older. This island, at the junction of the St. Lawrence and Ottawa rivers, was long a gathering-place for pre-historic Amerindians. In Old Montréal you can explore the archeological history of Montréal at the Pointe à Callière Museum of Archeology located above an active archeological site of the earliest settlements, and discover Montréal’s colonial history in an 18th-century manor house, Chateau Ramezay on Place Jacques Cartier and in the lovely 18th-century churches of la Chapelle Notre-Dame-de-Bon-Secours and the Notre Dame Basilica. Old Montréal also has several historic Victorian houses, now historic sites, all a pleasant stroll from our hotel. Montréal is also a college town. 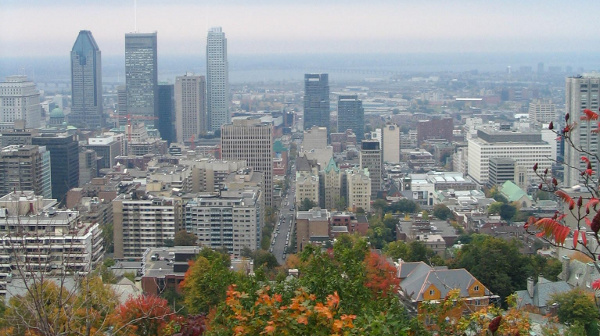 In addition to world-renowned McGill University, located just a few blocks from our hotel, Montréal is home to Concordia University (incorporating the former Loyola College), Université de Montréal, and Université de Québec à Montréal. We also have six community colleges, known as “CEGEPs” (colleges of general and professional education), which offer free post-secondary education for two or three years in both French and English for students who have finished high school (at Grade 11) and wish to prepare for university entrance or for technical diplomas. As a result, Montréal is a thriving centre for knowledge industries like software development as well as research of every variety and all the creative and performance arts. We’re also very sportif. Montréal invented the Bixi bike rental system, so bring your helmet. In many neighbourhoods, especially those served by our excellent network of bike paths, you’ll see more bikes than cars. Montréalers also love their professional sports teams—NHL (the Canadiens or “Habs”), NFL (the Alouettes), and Soccer (The Impacts)—and are still mourning the loss of their beloved Expos. The Old Port (Vieux-Port) in Old Montréal is a national park site for walking, cycling, picnicking, swimming, riding the Lachine rapids, visiting ships, hearing concerts, eating good food and drinking beer and wine at cafés. Mount Royal Park, for which our city is named, is a public park in the centre of the city, designed by Frederick Olmstead (think Central Park on a hill) and providing sunny meadows, wooded paths, restaurants, an artificial pond known as Beaver Lake, a sculpture meadow, an illuminated Cross at the summit, and great views in every direction, just a short uphill walk (or bike, or run) from our hotel. But most of all, Montréal is a great—and safe—city for strolling, café-sitting, relaxing, and meeting people for a café or an apéro. While officially French, Montréal has had a strong English community ever since British General Jeffery Amherst conquored the city in 1760. During Jane Austen’s lifetime Montréal was a British garrison town, its society dominated by successful Scots merchants who built their imposing mansions, churches and clubs in the neighbourhood just north of our hotel known as “the Golden Square Mile.” Today’s visitors are encouraged to try using their French—locals will be charmed—but they will have no difficulty communicating with multilingual Montréalers. Indeed, this cosmopolitan metropolis has citizens—and restaurants—from every place on the world map. Please plan to explore our city on your own or with one of our tours.